72.11 BRP VALUE: India is part of the British Commonwealth and has its own units. The India box is worth 10 BRPs. The Indian BRPs are included in the British base and contribute to the British construction limit. A. India begins the game with four 2-2 and four 1-2 infantry units. B. Western Allied military production may be used to increase the Indian infantry force pool by up to three infantry factors of any denomination (one 2-2 and one 1-2; or three 1-2s) in any Allied player turn following the outbreak of war between Britain and Japan or in Spring 1942, whichever is earlier. 72.13 GEOGRAPHICAL RESTRICTIONS: Indian units are placed on the mapboard at the start of the game and are subject to the deployment limits set out in the table below until war breaks out between Britain and Japan. Once war breaks out between Britain and Japan, the restriction in 72.14 continues to apply, but Indian units may deploy and operate without restriction in the Southeast Asian front of the Pacific theater. 72.14 USE IN EUROPE LIMITED: In Fall 1939, one Indian 2-2 and one Indian 1-2 infantry unit may be NRed to Europe; the other Indian infantry factors must remain in Asia. Indian units sent to Europe may be replaced if lost, provided no more than one Indian 2-2 and one Indian 1-2 infantry unit are in Europe at the same time. Indian units are restricted to the Mediterranean front and Ethiopia. A. CALCUTTA, DACCA: Calcutta and Dacca are part of India, but for BRP purposes are treated as British colonies worth five BRPs each. B. CEYLON: Ceylon and Colombo are part of India and have no BRP value. 72.161 LOCATION: Indian units may be constructed in Indian hexes or in the India box. 72.162 PER TURN LIMIT: The Indian construction limit is three BRPs of infantry of any denomination per turn, but this limit may be reduced by a maximum of three BRPs per turn by Japanese bombing of and rocket attacks against the India box (72.321) and the presence of Japanese ground units adjacent to the India box (72.42). B. Following either the outbreak of war between Japan and the U.S. or a British surrender, by the U.S., with the construction cost counting against the American construction limit. One Indian Ocean transport and either one Atlantic or one Pacific transport must be used for every five American BRPs granted to India in any turn in which the U.S. pays for the construction of Indian units. 72.164 INDIA AFTER A BRITISH SURRENDER: Indian force levels and BRPs are unaffected by a British surrender (59.513B). Indian units may be lent to the U.S. after a British surrender (59.53). 72.17 BRITISH FORCES: One 2-3 armor unit, three 1-2 infantry units, two replacements, two AAF, one cruiser and one destroyer factor must begin the game in Asia and remain there until the outbreak of war between Britain and Japan. Their deployment is restricted as set out in the applicable scenario. 72.21 THE INDIA BOX: The India box represents that part of India which does not appear on the board. The India box, which appears on the Pacific mapboard, is distinct from the Indian Ocean SW box, which appears on the European mapboard. 72.211 BASING: The India box has an unlimited basing capacity for Western Allied air and naval units. A. GROUND UNITS: By moving from an Indian hex south of the Himalayas adjacent to the western edge of the mapboard and by sea transport. Sea transport may originate in eligible ports on the Pacific mapboard, Suez, Basra or Abadan. B. AIR UNITS: By staging from an Indian hex off the western edge of the mapboard or by sea transport. C. NAVAL UNITS: By changing base into the India box. Base changes may originate in the Australia box, the South Africa box, eligible ports on the Pacific mapboard, Suez, Basra or Abadan (5.48B). A. ARMOR UNITS: By exploitation movement from an Indian hex off the western edge of the board south of the Himalayas. A. By TR from an Indian hex or SR from an objective off the western edge of the board south of the Himalayas, or by NR, via hex CC2 or from the Australia box, the South Africa box, the Ethiopia box, Suez, Basra, or Abadan. B. NRs between the India box and other eligible mapboard boxes may not be intercepted by Japanese units. 72.224 JAPANESE UNITS PROHIBITED: Japanese units may not enter the India box (EXCEPTION: Japanese bombing - 26.462). 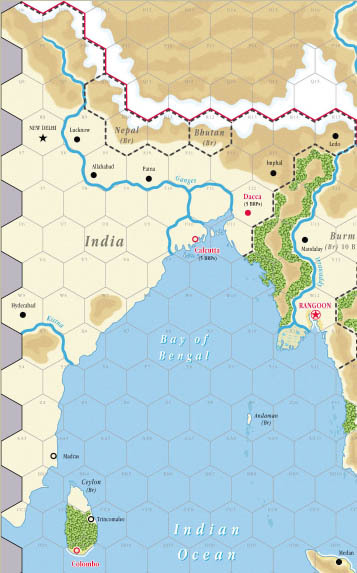 72.23 LEAVING THE INDIA BOX: Western Allied units may leave the India box by moving, staging, sea transporting, seaborne invading or redeploying onto the mapboard, including by moving ground units into vacant Japanese-controlled hexes on the edge of the mapboard. Western Allied units may not leave the India box if this results in there being fewer Western Allied ground factors in the India box than there are Japanese ground factors adjacent to the India box along the western edge of the mapboard. NAS based on carriers in the India box may not stage onto the mapboard. 72.24 AIR MISSIONS: Japanese air units may not fly missions into the India box (EXCEPTION: Japanese bombing - 26.462). Western Allied air units in the India box may not fly missions onto the mapboard. 72.25 GROUND ATTACKS: Ground attacks from the India box onto the mapboard, or from the mapboard into the India box, are prohibited. 72.31 ATTRITION COMBAT ONLY: The India box and all adjacent Indian attrition zones are considered to be a single attrition zone unless India has surrendered. Japanese ground units adjacent to the India box may attrition, and be attritioned by, Western Allied ground units in the India box. Hex results achieved in attrition combat may not be used against the India box, nor may Western Allied ground units capture hexes by attrition advance from the India box. No offensive operations involving ground units are permitted in the India box. 72.32 AIR OPERATIONS: The only offensive air operation permitted into the India box is Japanese bombing. Air combat between Japanese air units which are bombing the Indian box and Western Allied air units in the India box is resolved normally. For offensive operation purposes, the India box is considered part of the Southeast Asian front. Air attacks against Western Allied air units in the India box are prohibited. 72.321 JAPANESE BOMBING EFFECTS: For every three BRPs lost as a result of Japanese bombing or flying bomb attacks against the India box, the Indian construction limit (72.162) and the British construction limit are reduced by one BRP. For every BRP lost as a result of Japanese rocket attacks against the India box, the Indian construction limit (72.162) and the British construction limit are reduced by one BRP. The maximum reduction in the Indian and British construction limits each turn is three BRPs. 72.33 INTERCEPTION OF NAVAL ACTIVITIES: Sea transport, seaborne invasions and NRs to and from the India box may only be intercepted if they pass through mapboard hexes. 72.41 BRITISH BRPs: For each Japanese and Indian National Army ground factor adjacent to the India box in excess of the number of Western Allied ground factors in the India box at the end of the Japanese combat phase, Britain loses one BRP, up to a maximum of 10 BRPs per turn, unless India has surrendered. 72.42 INDIAN CONSTRUCTION: For every three British BRPs lost because of Japanese and Indian National Army ground factors adjacent to the India box, the Indian construction limit (72.162) and the British construction limit are reduced by one BRP. 72.43 INDIAN SURRENDER: India surrenders if, at the end of any Allied player turn, there are at least ten more Japanese and Indian National Army ground factors adjacent to the India box than there are Western Allied ground factors in the India box. 72.431 India may voluntarily surrender at the end of any Allied player turn. A. All Indian units are permanently removed from the board. B. All non-Indian Western Allied units in the India box are eliminated. C. Western Allied units may not enter or draw supply from the India box. D. All construction in the India box is prohibited. E. Britain's BRP base is reduced by 10 BRPs and Britain loses the prorated value of the India box. The BRP penalty for Japanese units being adjacent to the India box no longer applies (72.41). F. Hex control of Indian hexes is unaffected. Indian hexes may be entered by either side. G. The British resistance level is reduced by two. H. Western Allied BRP grants to China through the India box are prohibited. 72.52 JAPANESE BRPs FOR INDIA: If India surrenders, India is considered a Japanese overseas conquest worth 10 BRPs. 72.53 RECONQUEST PROHIBITED: The effects of an Indian surrender are permanent and may not be reversed. 72.61 ALLIED CONTROL: The India box is an unlimited supply source for Western Allied units unless India has surrendered. Supply may be traced from the India box onto the mapboard through the Indian hexes along the western edge of the board south of the Himalayas, or by sea onto the Pacific mapboard through hex CC2, using one Indian Ocean transport for each sea supply line. 72.71 NAVAL OPERATIONS FROM THE INDIA BOX: Naval units based in the India box may carry out naval activities, including interceptions. Such naval units appear on the board at hex CC2, where the coast of India intersects the western edge of the Pacific mapboard. This hex is eight hexes from the ports in the India box (5.42B). 72.81 CALCUTTA AND DACCA: Calcutta and Dacca are each worth five BRPs. If Britain loses control of Calcutta or Dacca and fails to regain control of the city in the following Allied player turn, Britain loses the prorated BRP value of the city and Japan gains the prorated BRP value of the city as a conquest. Calcutta and Dacca are not key economic areas and their loss has no effect on the British BRP base or the British or Indian construction limits. 72.82 COLOMBO: Colombo has no BRP value, but may be used as a base for Japanese raiders into the Indian Ocean SW box, and gives Japan a favorable modifier for submarine warfare in the Indian Ocean SW box. 72.83 RANGOON: Rangoon is the capital of Burma, which is a British colony (74.11A). 72.91 INDIAN NATIONAL ARMY: The Indian National Army is a Japanese-controlled force which historically was intended to assist the Japanese in overthrowing British rule in India. A. Indian National Army units may only be constructed by Japan if it has achieved an Indian subversion production result (42.26F, 44.34A). B. Japan may construct one 1-2 Indian National Army infantry unit each turn or may instead defer the construction of a 1-2 Indian National Army infantry unit in order to build a 2-2 Indian National Army infantry unit in a subsequent turn. No more than one unbuilt Indian National Army factor may be accumulated for future turns in this manner. C. Indian National Army infantry units may be constructed in any fully supplied city in India or Burma controlled by the Japanese at the start of their player turn. D. Japan pays the BRP cost of constructing Indian National Army units. A. An Indian subversion result (42.26F) permits Japan to build one Indian National Army infantry factor and one Indian partisan each turn up to a limit of one 1-2 and one 2-2 infantry unit for each of Calcutta, Colombo, Dacca and Rangoon controlled by Japan, plus two Indian partisans regardless of the number of objectives controlled (72.92B, 72.93B). B. Allied recapture of a Japanese-controlled Calcutta, Dacca, Colombo or Rangoon reverses this force pool addition. Adjustments to the Indian National Army force pool occur during the Japanese unit construction phase following Japan’s capture or loss of the objective. Reductions in the size of the Indian National Army force pool affect unbuilt units only - Indian National Army units on the mapboard remain in play until eliminated. 72.94 GEOGRAPHICAL RESTRICTIONS: Indian National Army units may operate only in Burma or India.